If you are looking for a good DIY project that can greatly benefit your home, you should try installing nice-looking beadboard paneling. Based on my own experience, installing beadboard wainscoting on the walls of our house was relatively free of any kind of major hassles, and we actually finished the work in just one weekend; both installation and finishing. If you are still a bit unsure on whether it is actually possible for you and your family to install beadboard panel wainscoting, please allow me to convince you by teaching you more about this rather old, but still effective method of beautifying your home. Beadboard wainscoting first became popular in the 1800’s as a means of protecting the walls of high-activity rooms in the house like kitchens and hallways. They were once made from the leftover tongue and groove planks that were used for the floors; beadboard wainscoting got its name because of the beading that was caused by the connection of the wooden planks. Besides protecting the plaster wall from damage, beadboards also give a pleasant two-tone finish to any wall; I also think it gives a country home charm to any room. Is Installing Beadboard Paneling A Good Diy Project? I believe that installing beadboard wainscoting can actually be a great weekend DIY project; that’s what we did when we installed wainscoting on our kitchen walls. What’s great about installing wainscoting from beadboards is that you almost always have to cut only one side of each plank. And because beadboards already come in wide boards, I do not have to cut thousands of T and G planks to exactly the same length, we only used a couple of planks to completely cover up one wall. 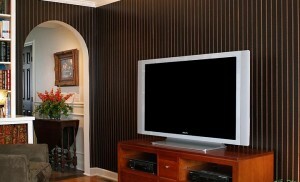 Once you get the hang of it, you can actually finish installation and painting of the wainscoting in just one day. Even though white is the most common color for wainscoting, it is not the only choice that you have for finishing your beadboard panels. For instance, we were fortunate enough to get boards that have a beautiful grain running on them, so we just lightly stained them the same shade as our kitchen cabinets to make everything match. There are no set guidelines on how you should finish your beadboard panels; you are only limited by your own creativity on this one. Remember that half the fun of remodeling your home is when you get to express your own quirky characteristics through your paint choices. Beadboards are cost-effective implements when you want to give the interior of your house a completely new look. If you want to learn how to properly install them yourself, there are plenty of easy-to-follow instructional videos online that you can use as reference, make sure that you understand everything before you even start. Once you have installed beadboard paneling in your home, I guarantee that you will be spending a lot of time admiring the beautiful new look of your home.